Ford – HubNut – celebrating the average! I seem to have found the limits of the Maverick, in some very muddy woods in Carmarthenshire. I had concerns about taking the Maverick to a Pay and Play site. I’ve been to a couple before and found them rather a challenge for vehicles in stock form. Bodywork damage seems inevitable, as does getting stuck as a lot of the trucks there are very much modified – which means deeper ruts than a stock vehicle can cope with. And that was the undoing of the Maverick. I was amazed about how a friend’s near-stock Defender coped in the same conditions. 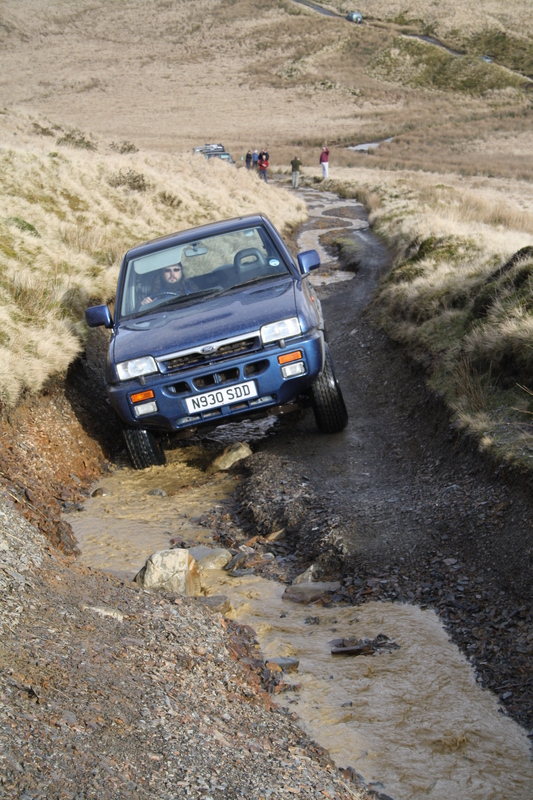 That extra ride height, axle articulation and some proper mud-terrain tyres kept it going where the Maverick failed. Which was good as it rescued me several times! But, the Maverick is happily proving more than just an off-road toy. It’s also been busy hauling wood about. It’s nice that I can chuck 300kg of wood in the back and it barely notices. If anything, it stops better because a load sensing valve increases rear brake pressure – which makes the rear shoes work harder. That has to be good for them. A loss of brake fluid, which stopped the rear brakes working altogether, has caused some concern. I’m monitoring to see if it drops again, in which case I think one or both rear wheel cylinders could be to blame. There was so much mud and water in there when I cleaned it all up at the weekend that I couldn’t tell if there was a leak or not. Project Budget 4×4: Off the tarmac at last! I didn’t actually set off from home with the intention of tackling some local byways, but found myself in Nant-y-Moch. I’d gone for a drive primarily to get some new photos of the Maverick and also to help the new brake pads and discs bed in. The Nant-y-Moch area has many byways, though still some idiots insist on heading off-piste. I always stick to the routes signposted by Tread Lightly as I consider myself a responsible 4×4 owner. On the drive over there, while I checked that my injured back was up to it, I began to compare the Maverick to the Range Rover I owned last year. The Range Rover was the first European 4×4 that made any attempt to behave like a car. It was quick, comfortable and handled well. That was by the standards of 1970 though, and by 2011, my 20 year old Rangie felt far too much like a wallowy barge. The Maverick behaves much more neatly, with controlled bodyroll and a surprisingly comfortable ride for such a short 4×4 – though it can’t match the Rangie for sheer comfort. It beats it hands down for handling though, with a delightfully sharp turn in. You do have to be careful though. It’s rear wheel drive only on the road, with a limited slip differential and the short-wheelbase combining to make a spin an easy possibility if you aren’t careful. I am careful, but I do bear it in mind. After a pause for photos, I decided to tackle one of the Nant-y-Moch lanes. I know it pretty well, so I knew that there shouldn’t be anything too challenging. Heading away from tarmac on your own is always a risk though, especially in a new vehicle. Once on to the rock and gravel track, I dropped it into 4-wheel drive and the low ratio gearbox. That gives greater control and as this lane is mainly rocky, and I was not wanting to damage my back, I would be travelling slowly. Initial impressions were good. While the ride was firmer, I wasn’t in any pain and a few tricky sections were tackled without a lack of traction. Pictured is a sinuous, rocky climb up a very narrow passage. The Maverick seemed to be handling this fine, and while the petrol engine lacked the lugging torque of the Range Rover’s diesel, it was making light work of this. All good. Then I got stuck. One very rocky section required maximum flex from the suspension. I hadn’t considered that it would struggle here as the Range Rover just plodded through here using its massive axle articulation to keep all wheels on the ground. The Maverick came to a wheel-spinning halt. I tried a bigger dose of power, but it was no good. No traction here, despite that limited-slip rear diff. The only option was to reverse. This is the good thing about getting stuck on an incline. It’s usually quite easy to get yourself moving again. I then tackled the section with more momentum, in low second. This time – and no doubt with at least one wheel waving in the air – it cleared the obstacle. Phew! For a modern 4×4, the Maverick actually has pretty decent axle articulation, but chatting with friends on the Nissan 4×4 Owners Club, it seems likely that the rear anti-roll bar is hampering flexibility. The advice is to remove it, but I shall consider this decision for a little longer yet. There then followed some icy fording sections, reminding me that it had been very cold out this way recently. Thankfully the depths were not an issue and I was soon able to return to the beaten track once more. So, there we have it. My first off-road spell and I’m pretty impressed. It struggled with axle articulation, as I suspected it might do, but I did not get irretrievably stuck and it felt very capable. A longer, more challenging route will be attempted as part of a group this coming weekend. I shall report back. Brake work on the Maverick continues, but all is not well. After the horrors of finding one front brake pad worn down to the metal, the overhaul has revealed further issues. The first step was to pull apart the offside brake – the one with the faulty caliper. During this work, it quickly became apparent that the slide pins that the caliper moves on were totally seized up. This is what caused extreme wear on one pad – the seized caliper pistons just exaggerated the problem. 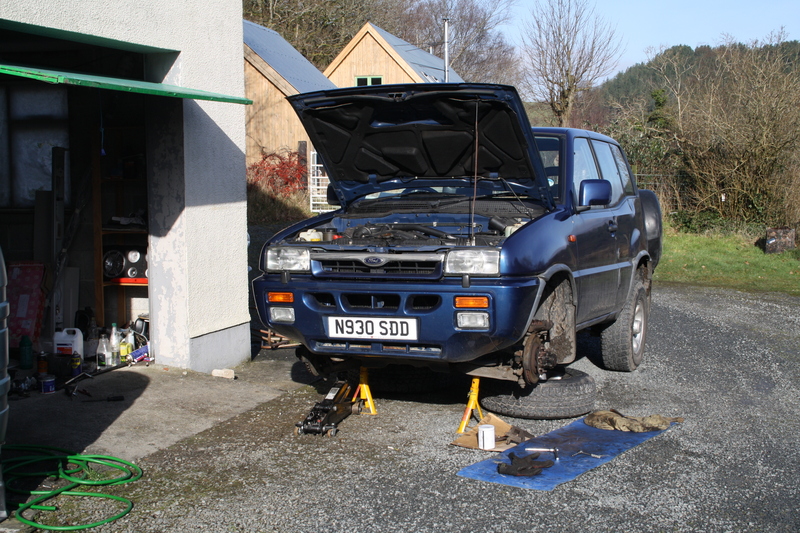 The advice on the Nissan 4×4 Owners Club forum was to remove the entire caliper assembly, so it can be worked on away from the vehicle. If I had a big vice, this would have worked nicely, but I only have a battered Black & Decker workmate, which wouldn’t really help. The caliper itself is a unit that holds the pads. There are two caliper pots on one side which act directly on one brake pad. The pressure then pulls the whole caliper towards the inside of the car, which thereby acts upon the opposite brake pad. Presumably this is an economic measure as most 4x4s would have four caliper pots per front brake, rather than the two used here. I consider it a fairly flakey idea as it just allows something else to go wrong – the sliders in this case which prevented the caliper from moving correctly. So, the caliper was quickly lifted out of the way. The next challenge was to remove the slider pins from the caliper carrier. Brute force was necessary, all the while bearing in mind that there’s a good chance of snapping the pins if you get carried away. The pins have a 17mm nut at the end, which initially made me think they had to be unscrewed. No. This is merely to allow you tighten up the 13mm headed bolts that hold the caliper to the carrier. I used a lot of penetrating oil, and one pin responded well to a chisel and a hammer – eventually coming free. The top one was very, very stuck though. I tried waggling it back and forth with a spanner, then tried the chisel and hammer approach, all the while soaking it in penetrating oil. After a very lengthy battle, it finally came out. No wonder the caliper wasn’t working! On the passenger side, the pins moved beautifully under no more than light finger pressure. Then I could remove the caliper carrier and then the hub and brake disc. This isn’t too tricky, though there are lots of bits to keep an eye on and remember where they live. The auto-locking hub has to come off (an ideal opportunity to lubricate), then a circlip and some washers, followed by the outer wheel bearing and finally the disc/hub. Separating the disc and hub proved very tricky, on both sides. For a start, the 14mm headed bolts were a pain to undo. If I’d remembered the instructions I’d seen online, I would have undone these bolts while the brakes were still fitted. As it was, I had to use a bar to prevent the hub from turning. Then the hub and disc seemed almost welded together with rust and friction. It took another serious bout of hammer-and-chisel work to separate the two parts. Then it was quite easy to fit the hubs to the new discs and re-assemble. A good opportunity to repack the bearings with grease. Sadly, I ran into problems locating new sliding pins, so work drew to a halt. I thought I’d try reassembling the nearside caliper, but then realised that the pistons were seized here too! Annoyingly, I’d already ordered a new caliper for the offside, so missed an opportunity to combine postage. The calipers cost £67 each delivered. I did consider rebuilding the calipers, but I’ve done it before and it’s not much fun. The parts were proving almost as expensive as a remanufactured caliper anyway, so the bullet was bitten. That means that total expenditure is now past my original £800 desire. I am left hoping that future months will be much cheaper!